use a different colour cone for each line. coach can then call for players to go to that colour. after 4 stations then proceed with partner dynamic stretches. as part of a dynamic warm up players are then asked to crawl doing spidermans to next station. then sumo squats, then lunges-forward/lateral. once players have got the hand of this and are thoroughly warm. 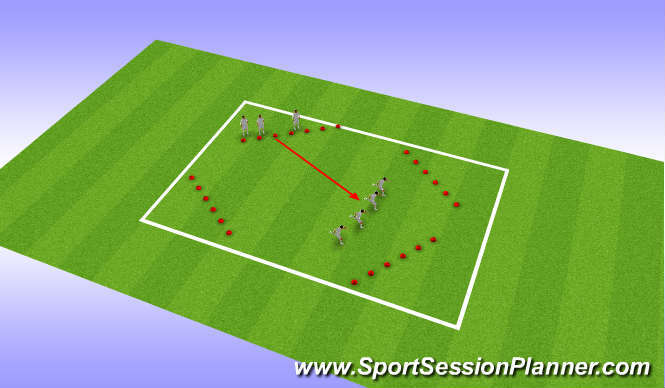 then start to call a different direction to go to before players have stopped. This then starts to get the players reacting to an unanticipated stimulus and have to react accordingly. finaly players are divided into teams and 1 team goes to colour that coach calls out and other team has to go to opposite to that 1.